I've got fall colors, couples and honeymoons on my mind as I write this week's blog. I think it's because of our recent trip to Muskoka. I blogged last week about our stay at Foxwood Resort on Lake of Bays, meeting other couples and visiting the town of Dorset near Algonquin Park. This week, I'm writing about three other resorts that we visited in the area last week; Cedar Grove Lodge, Pow Wow Point Lodge and Beauview Cottages. Like Foxwood, they're all cottage resorts, members of Resorts of Ontario and in fall, couples are a big part of their business too. [caption id="attachment_258" align="aligncenter" caption="One of the log cabins at Cedar Grove Lodge"] [/caption] I'd never been to Cedar Grove but I knew about it from my years with Ontario's offiical government tourism office. Its log cabins and fieldstone fireplaces are a big seller and last Thursday was no exception. Cedar Grove is just east of Huntsville on Peninsula Lake, down a gravel road from Highway 6o. The place was in siesta mode following lunch hour but several guests were signed up for a late afternoon pontoon ride. Others were in big Muskoka chairs reading on the dock and one couple was playing tennis. All the cabins ranging in age from 50 years old to 2 years old, were occupied but an NYC couple volunteered to show us theirs. The guy told us a big reason he and his wife chose Cedar Grove was because it's pet-friendly. "We simply don't travel without our dog, he said. "He's had a stroke and a kennel would kill him." Another deciding factor may have been their luxury log cabin. It was nice. Really nice. New, furnished in Canadiana style with two bedrooms, a comfortable living room and a massive fieldstone fireplace. No kitchen though. This resort is American Plan which means three meals a day are included in its daily rates. Meals are served in a classic resort setting and local suppliers like Edible Fungi, a shitake grower, are sourced. Cedar Grove is the only resort in Ontario to carbon offsets and it was the first of many Resorts of Ontario to receive the Four Green Leaf Audubon Award for its environmental practices. [caption id="attachment_259" align="aligncenter" caption="Just before the leaves start to turn at Pow-Wow Point Lodge"] [/caption] Pow Wow Point Lodge is a country neighbour of Cedar Grove's. The same gravel road off of Highway 60 takes you to it. Jack and Jacquie Howell bought Pow Wow in 1969. Their son Doug now runs it with his wife Dee, an interior designer. The main lodge has a big lounge, dining room and lakeview patio. I fell in love with the mini flatbed rail car that serves as a coffee table in front of the lounge fireplace. A beautiful upstairs suite was the location for Canada's Worst Handyman which filmed its entire fourth season here. What really caught my eye at Pow Wow though was the Boathouse suite. An original Muskoka boathouse, it once served as staff quarters and then five years ago, Doug and Dee renovated the place. I think a stay here would make a great wedding gift. 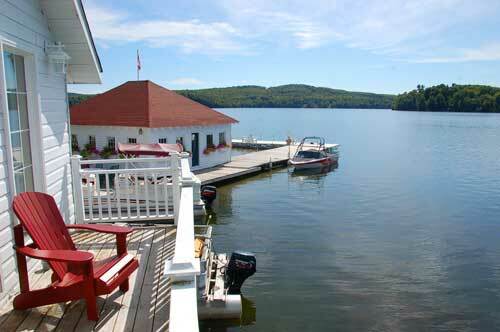 [caption id="attachment_260" align="aligncenter" caption="Late-summer peace at Beauview Cottage Resort"] [/caption] Beauview Cottages Resort is on the upper half of Lake of Bays along with Foxwood and several other Resorts of Ontario cottage resorts. 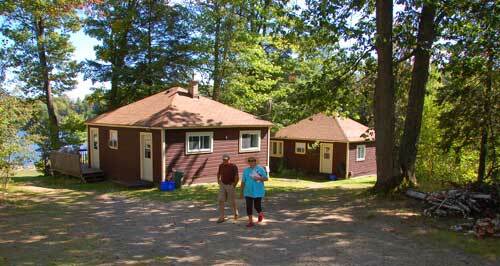 Owned by Gord and Nancy Bell, it's located in a quiet bay not far from the Muskoka River. Smaller than the other resorts, it has a new two-storey honeymoon cabin. Beauview is popular with Europeans. Gord blogs and videotapes a lot, so maybe that's why. The honeymoon cabin was occupied by a pair of honeymooners so we couldn't check it out, but I did go into one of the older cabins. It was spotless and included a fully equipped kitchen, tv, and three-piece bath. But it was the private hot tub on the front deck that won me over. Four out of the six Beauview Cottages have one. Fall colours were just starting so, I figure late September through early October, they'll peak in Muskoka and Algonquin Park. 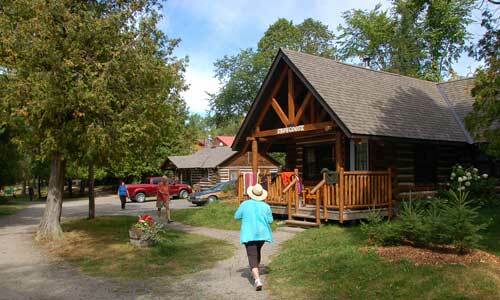 For a listing of all Resorts of Ontario members in Muskoka, check here.